With currently around 2.8 million inhabitants, Taichung City’s main transport corridors are suffering from heavy congestion. Especially during peak hours but also on holidays, the intersections in the suburban area of the Daya Region, close to the ramps of Freeway 1 and Expressway 74, are packed with traffic. The highway ramp metering system often leads to oversaturation and congestion, spilling back on to the associated urban roads and junctions thereby reducing overall network efficiency. 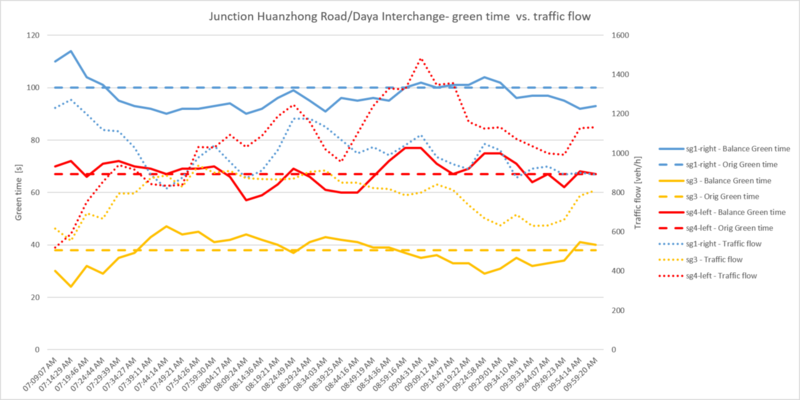 On particularly busy days, motorists driving on Huanzhong Road from east to west, experience travel delays of up to 45 minutes. Cars travelling from south to north on the Zhongqing Road are also frequently affected by delays. In total, the area covers approximately 535 kilometres of roads with 61 signalised intersections. To improve traffic flow, Taichung City already implemented different engineering actions: They added another lane for vehicles turning left at the junction of Huanzhong Road and Daya Interchange Contact Road. During peak hours and on holidays, the hard shoulder is also used as an additional lane to keep traffic moving. As a third intervention, Taichung City added one lane at the junction Huanzhong Road and Daya Interchange Contact Road for vehicles traveling southwards to further minimise the delays at the intersection. Comparison of the PTV Balance signal plan to the original plan with fixed timing for the morning peak hours. The real-time traffic management software, PTV Optima, combines real-time data with a model-based approach for a detailed analysis of the current traffic state and a comprehensive forecast for a period of up to an hour. The system detects incidents at an early stage and helps operators work out a response plan to reduce negative impacts on the traffic flow. Based on the analysis and prediction of PTV Optima, Taichung City can now provide motorists at the Daya interchange with alternative route guidance published on variable message signs. As the real-time traffic management software calculates the rerouting effects on the entire network area, drivers always receive reliable recommendations and know which alternative path they should take to access Freeway 1 and Expressway 74. “We are pleased to be the first system integration partner to introduce PTV Optima and PTV Balance in Asia. This is also the first project for our telecom operators to promote an ITS solution. We will expand the use of mobile big data as a new data source for intelligent transportation services in smart cities“, says Kevin Yeh, Director at FET. At six intersections in the Daya Region, the city installed the dynamic signal timing solution, PTV Balance to optimise signal control. Based on the data input provided by the detectors placed along the road network, the software identifies any changes in the transport patterns and reacts to what is happening on the road. As a model-based control system, PTV Balance even goes one step further by automatically designing a range of signal control options and sending the optimised signal plans to the local controllers in a 5-minute interval. This way, Taichung City coordinates ramp metering in the Daya Region and reduces the overall travel delay for motorists. “The implementation of PTV Optima and PTV Balance aims to optimise capacity and efficiency of the road network“, says Omid Ejtemai, Managing Director of PTV Asia-Pacific. “The goal is to predict traffic conditions, provide real-time information to travelers and in case of disruptions, help divert traffic and offer alternative routes.” During the five-month project phase from October 2017 until February 2018, PTV Optima and PTV Balance have enhanced the network capacity, so that drivers can reach their destinations faster and more conveniently. In detail, PTV technology has reduced the area-wide average travel time by 9.4%, improved average traffic speed by 8.4% and increased the throughput rate by 7.6%. PTV Optima and PTV Balance work together specifically to increase their respective potential to improve traffic flow in Taichung City.